In this particular instance, when the question on every investor’s mind is whether or not the dramatic fourth quarter decline in stocks has fully run its course, the conundrum is that the start of a new leg higher in a bull market looks remarkably similar to a counter-trend rally in an ongoing bear market. Indeed, while the likelihood of a sustainable market low already being in place increases with each day of equity market advances, there are several characteristics of the post-Christmas rally that are historically much more closely affiliated with bear markets than bull markets. However, that is not to suggest that the macroeconomic backdrop for equity prices has not improved dramatically in the days since Christmas. Indeed, when you consider the almost all-encompassing scope of the improving fundamentals, the current rally is hardly surprising, albeit much stronger than virtually anyone anticipated. Ironically, on numerous levels, it is actually the extraordinary strength and speed of the recovery itself which gives us some pause, as such powerful and abrupt stock market advances normally take place in the midst of bear markets rather than bull markets. Indeed, in our opinion, these dramatic counter-trend rallies (sometimes referred to as “bear traps”) often serve the same role in a bear market that “walls of worry” serve during bull markets. In both cases, they provide the fodder necessary to prolong the duration of the prevailing market trend. To explain, at its core, a bull market is the process of bearish investors becoming bullish investors, thus driving share prices higher, as an increasing number of dollars bid for a relatively set number of securities. A “wall of worry” is the term used to describe the composite of concerns that keep bearish investors and their money (i.e. the fuel to power future advances) on the sideline. There is an old saying that “markets climb a wall of worry”. A bull market ends when there are insufficient worries left to keep potential investors on the sideline, because that implies that there are no more bears left to convert to bulls, and thus no more money sitting on the sidelines that can come in and drive prices higher. It is the existence of a “wall of worry” that keeps investors from getting bullish all at once, and thus prolongs the duration of a market advance. During a bear market everything works in reverse, where the existence of giant counter-trend rallies serves to prolong the duration of major declines, both by sustaining sufficient investor optimism to keep everyone from getting bearish at the same time, and by drawing investors back into the markets, who had previously sold, and who are likely to sell once again, thus prolonging the duration of the decline. These sharp counter-trend moves are one of the reasons why bear markets last an average of eight months, and include a counter-trend rally that averages between 11%-14% (depending on the period analyzed). As compared to eight months, the recent decline lasted just over three months, and would be notable for its brevity, if that ultimately proves to be the entirety of the decline. 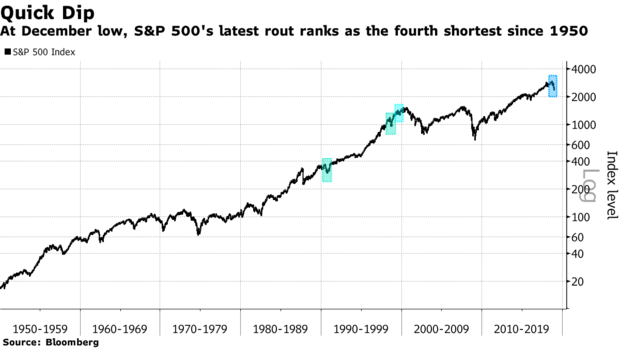 Indeed, if Christmas week did mark the bottom, it would have been the fourth shortest bear market since 1950. To put that into some perspective, since 1900, bear markets (20%+ declines) in domestic equities have occurred on average every 3.5 years. If Christmas marked the cycle lows for stocks and the markets do not go back and retest those lows, that would also be somewhat unusual as, of the 30 substantial declines that the domestic stock markets have experienced since 1960, 70% of them have seen the markets retest the initial “capitulation lows” before sustaining a move higher (i.e. forming a “W-shaped” bottom). It is noteworthy that such retests have historically occurred somewhat less frequently in instances when equity declines were not followed by recessions, which we view as a persistent, but non-imminent risk at the present time. To explain, stock market bottoms almost all form in a climax of fear, emotion and heavy volume, just as market peaks are accompanied by a pinnacle of euphoria, complacency and high volume. You will note volume as the common characteristic because, as the old saying goes, “volume equals validity”. We believe that volume is doubly important when attempting to identify major reversals in market trends, as inflection points tend to be associated with huge surges in volume, as they are times when both bulls and bears are confident in their opinions, and are prepared to back up those opinions with cash. We view the surge in volume as evidence of bulls and bears fighting over control of the market trend. Such conditions tend to introduce significant two-way risk and much higher volatility, as we have seen over recent months. The importance of volume is very well illustrated in the above equivolume chart of all stocks listed on the New York Stock Exchange, where heavier volume days are denoted with wider bars (i.e. they take more space on the X-axis), in addition to volume being reflected in the volume bars at the bottom of the chart. You can see the huge surge in volume at the mid-September peak in the broad market (trend change), when small and mid-cap stocks started collapsing, and again during the week before Christmas, which identifies the pre-Christmas period as a potentially significant inflection point (i.e. “the reaction low”), which we believe was also likely the “point of maximum pessimism”. Just as we can measure volume, we can also measure both investor emotion and crowd psychology, including characteristics like fear, euphoria, greed, and capitulation, which is a particularly useful mindset to gauge, as capitulation is a requisite for the formation of virtually all significant market bottoms. Importantly, we have seen significant signs of capitulation, including the fact that the week before Christmas witnessed the heaviest two-day volume since 2011 and a 10-month high in volatility. Indeed, the VIX (“fear index”) surged close to the 40 level that has historically indicated capitulation bottoms, further suggesting the potential of a significant market low. Moreover, the week before Christmas was the worst week for the domestic stock markets in ten years, and produced the largest outflow from equity mutual funds in a decade. Each such indication of capitulation supports the premise that Christmas week marked a significant low in the markets, which may or may not still need to be retested. Moreover, we believe that you can largely attribute the extraordinary nature of this reversal to the fact that so many of the factors previously weighing on the markets were self-inflicted wounds, which made them relatively easily correctable, at least temporarily. Examples include President Trump’s jingoistic trade language and criticism of Fed Chairman Powell, and significant communication errors on the part of the Federal Reserve, each of which have been at least partially addressed. Unfortunately, the ongoing partial government shut-down, which is degenerating into a personal spat between Trump and Pelosi, has no apparent end in sight, which is concerning, as it is slowly and steadily weakening the domestic economy. Indeed, Deutsche Bank analyst Brett Ryan just released his estimate that “in the worst case, a full-quarter shutdown could subtract 1.4 to 3.5 percent from economic growth”. While those percentages may not appear that significant, it is important to remember that they are being applied across a $20 trillion economy. Such an outcome would bring the economy very close to recession. As is illustrated in the above two charts, the government shutdown is occurring against a backdrop of an economy that was already slowing to below average growth rates (indicated by the “0” line on the top chart), but where concrete evidence of a recessionary threat is still fairly hard to find (blue line, lower chart). 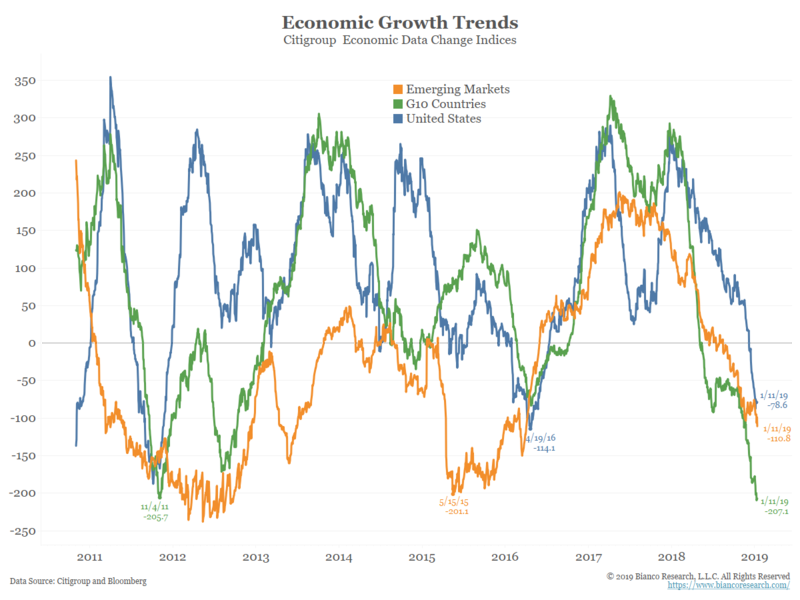 However, it is also occurring in an environment where both “soft data” (like surveys and corporate earnings guidance: gold line, lower chart) and, until just recently, the financial markets themselves, have been forecasting a rather dire economic outlook. 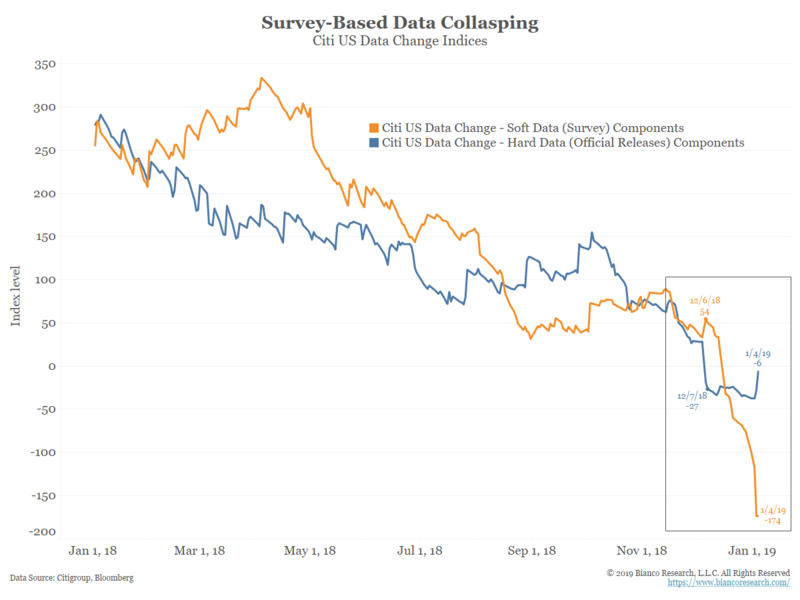 We maintain that it is of the utmost importance to understand the causes for this divergence between “hard” and “soft” data, particularly since the Fed’s perspective is so in synch with the “hard data”, while the markets seem much more aligned with the “soft data”. 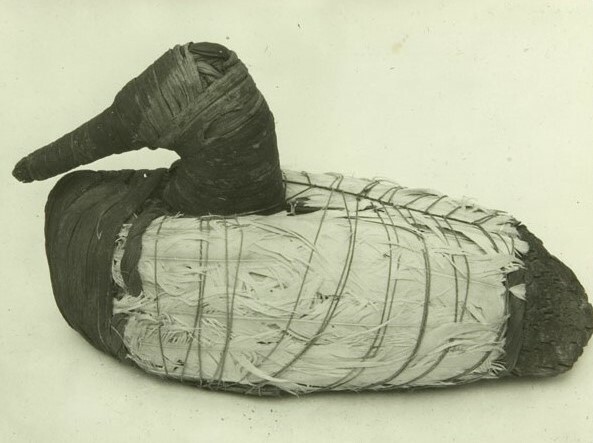 In fact, we have an almost unprecedented dichotomy, with the Federal Reserve still maintaining its outlook for both a strong economy and an ongoing need for tighter monetary policy- a position supported by most of the data (“looks like a duck, walks like a duck, and quacks like a duck”), while there is a growing chorus of voices that have the exact opposite opinion (no matter how much it happens to look like a duck). As per Fed Chairman Powell, who said on January 10th, “I don’t see anything that suggests the possibility of a recession in the near term is at all elevated,” and that he remains committed to using quantitative tightening to shrink the Fed’s balance sheet to a level “substantially smaller than it is now.” Further, while the Fed has recently reassured the markets that they would be “patient” and data-dependent in regard to any future rate hikes, we believe that the Fed was essentially forced to offer those reassurances to calm the markets, but that they would still prefer to move rates modestly higher if given the opportunity. 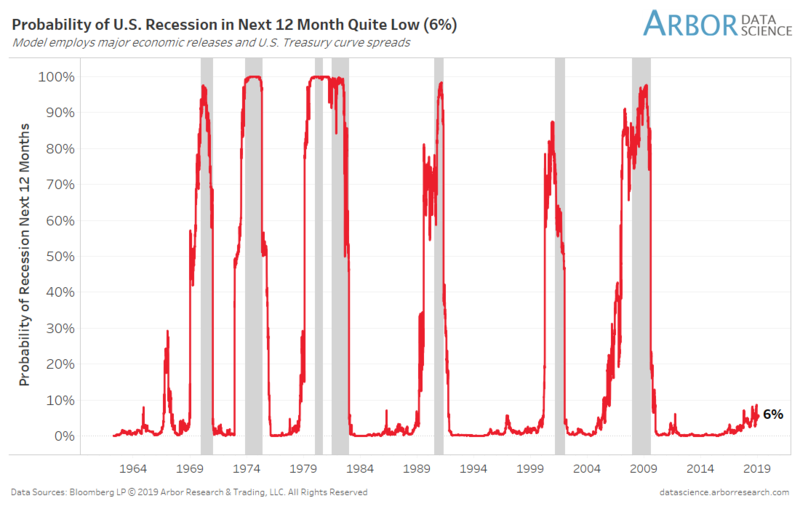 It is noteworthy that some of the more reliable recession prediction models strongly support the Fed’s perspective, and still assign a low probability to a 2019 recession. However, while Powell expresses both his commitment to continued quantitative tightening and a desire for higher short-term rates, the markets have priced out any potential for further rate hikes and have even, for the first time in eleven years, started pricing in a future rate cut. Meanwhile, pessimism abounds among corporate executives and economists alike. 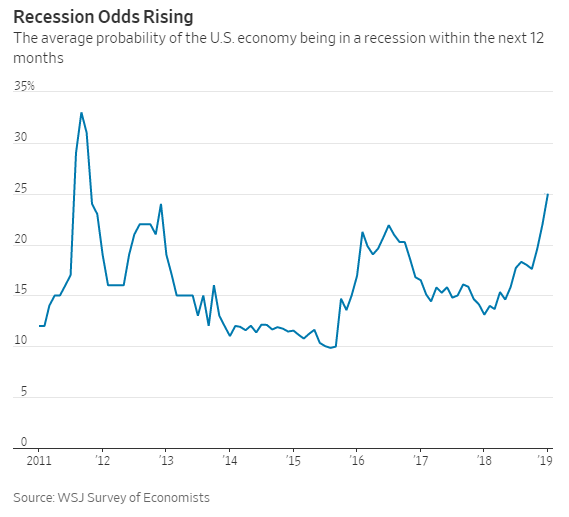 A January 14th Wall Street Journal survey of economists forecasted a 25% chance of a recession in the next year, which is the highest level since October 2011. More than half of respondents (56.6%) expect a recession to start in 2020 and 26.4% expect for a recession to begin in 2021. Further, according to the latest CNBC Fed Survey in December, respondents (economists, portfolio managers, and market strategists) saw a 23 percent chance of recession in the next 12 months, and almost half of the 134 U.S. chief executive officers surveyed by the New York Times last month said they expect the U.S. economy to be in recession by the end of 2019. That forecast was echoed by almost half of the chief financial officers who participated in the Duke University/CFO Global Business Outlook survey in December. We believe that much of the explanation for these divergent perspectives can be found in a November 4, 2010 Washington Post editorial penned by former Fed Chairman Ben Bernanke, which he used to explain the rationale behind the recently launched QE2 stimulus program. To the Fed’s credit, it all essentially worked as planned, but not because of a dollar for dollar benefit tied to the purchase of financial assets. It worked because of the program’s impact on consumer and investor psychology. It replaced pessimism and despair with optimism and hope. It might have even made financial conditions “feel” more favorable than they actually were. It is therefore, from our perspective, hardly surprising that the reversal of these programs would also reverse many of the positive psychological benefits that they produced, even to the point of potentially making financial conditions “feel” less favorable than they actually are. In addition, because the Fed, which controls short-term rates is fairly optimistic, they have been pushing short-term rates higher to quell potential inflation. 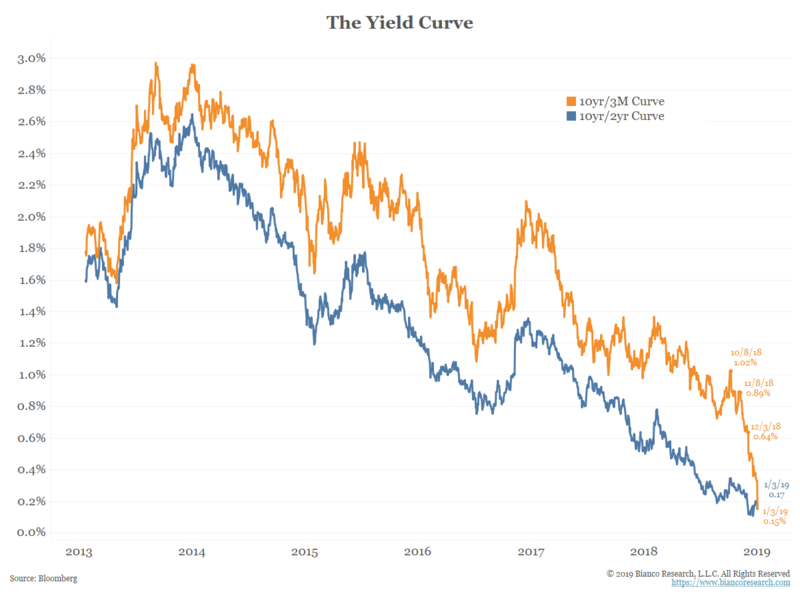 At the same time, markets, which control intermediate and longer-term rates, reflect the more pessimistic outlook of consumers and investors, and are thus pushing longer-term rates lower, thus inverting portions of the yield curve. Such a condition, where longer-term rates are lower than shorter-term rates, both slows activity in the lending sector and further depresses investor and consumer psychology, as inverted yield curves are almost always precursors for recessions. Ironically, it is possible that this very divergence in economic outlook between the Fed and the markets could ultimately end up being the catalyst for the slowdown that the markets are predicting, and that the Fed is currently dismissing, if it catalyzes a full yield curve inversion. We also believe that this divergence of opinions was largely responsible for last quarter’s stock market decline, as generally pessimistic investors grew convinced that the Fed was overly optimistic about the economy, and that their somewhat aggressive expectations for rate hikes (particularly when combined with a quantitative tightening program that the Fed had described as being on “auto-pilot”) would send the economy crashing into recession. In the fourth quarter, investors did what they almost always do when faced with such extraordinary uncertainty: they priced-in the “worst case scenario” which, unless the Fed does ultimately over-tighten, therefore causing a recession, has produced a rather attractively-valued equity market, which should provide some comfort for longer-term investors regardless of whether or not equities retest their December lows. It remains to be seen whether the Fed is right, and that investors are just mired in some quantitative tightening-imposed funk. In the meantime, signs of progress in the trade negotiations with China, combined with much less hawkish guidance from the Federal Reserve (and even modest improvement in the outlook for corporate credit), have all combined to catalyze a powerful equity market rebound back into an area of significant technical resistance (around last year’s first quarter lows). 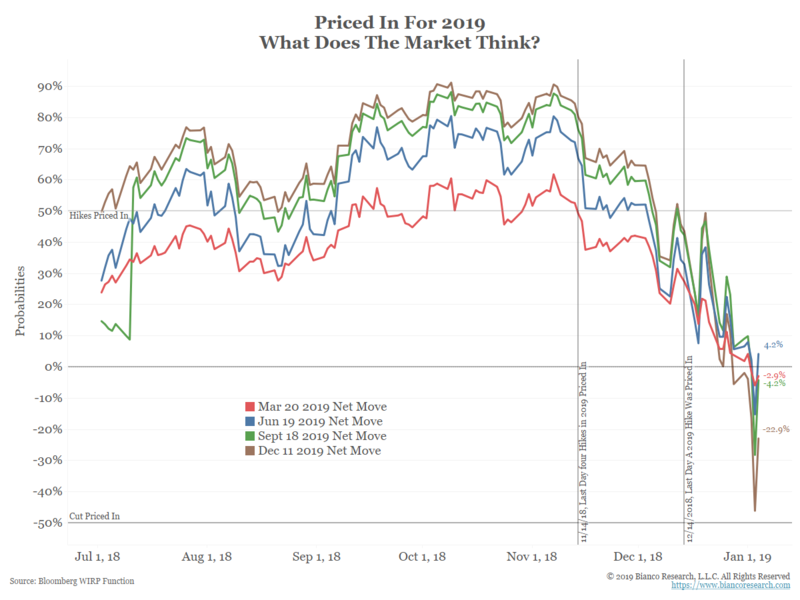 While we do expect for equity market prices to end 2019 reasonably higher than they are today, we also suspect that the rebound has probably come too far too fast, and that it is only reasonable to expect a partial retracement of the post-Christmas rebound. Indeed, given the fickle nature of markets, and the tendency of investors to “buy the rumor and sell the fact”, it would not surprise us if news on U.S./China trade was the catalyst for profit-taking, particularly since any deal by March 1st is unlikely to address the major issues of intellectual property theft, forced technology transfers and joint venture requirements. Even worse though would be the failure to reach a deal of any kind, which would likely lead to additional tariffs and renewed equity market declines, on a global scale. 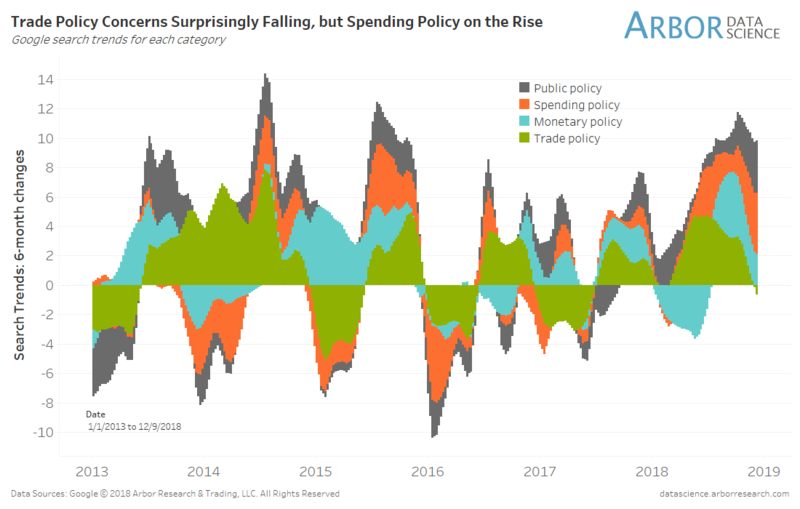 No matter what, investors should be prepared for continued volatility, as quantitative tightening is slowly letting the gas out of the stock market’s shock absorbers, just as a surge in uncertainty is adding an array of new potholes to the road.